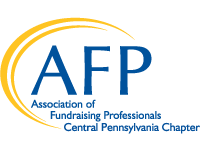 AFP Central PA will post your job to our website & send your job announcement as a one-time e-mail blast to our distribution list of 300+ professionals and managers currently working in the fundraising field and located primarily within the Central Pennsylvania area. The job will be posted for 90 days. AFP member charge is $50; non-member charge is $100 per posting. Please complete the credit card payment form and provide the ad copy in pdf format and e-mail both to afpcentralpa@gmail.com.